Sunday night drama Call The Midwife has been recommissioned for a fifth series BBC One has confirmed. As filming completes on the fourth series – set to hit our screens in January 2015 following a Christmas Special – the fifth series will consist of a Christmas special in 2015 followed by an 8-part series in 2016. 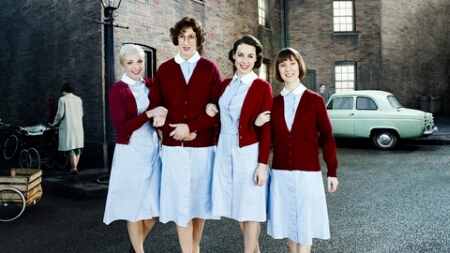 Starring Pam Ferris, Jenny Agutter, Miranda Hart and Helen George, series 5 will take the nuns and midwives into 1961 with new additions to the regular cast, including Linda Bassett (East is East, Lark Rise to Candleford) as Nurse Phyllis Crane and Charlotte Ritchie (Life Of Riley, Fresh Meat) as Nurse Barbara Gilbert. Vanessa Redgrave, who is the voice of the mature Jenny will appear for the first time as Jennifer Worth in the Christmas special episode. Made by Neal Street Productions (The Hollow Crown) and written by Heidi Thomas, the BAFTA-winning series has been one of Britain’s most popular dramas since it launched in 2012, with each episode averaging over 10m viewers.